Guys! You know what's crazy? Flipping through a cookbook and seeing photos of one of your friends (not to mention his incredible recipes) in it -- because that friend has a published cookbook! My friend Dan, of The Food in My Beard fame, has written a cookbook full of recipes for stuffed foods -- from Pepperoni Bread to Pork Belly Stuffed Cornbread Bites to Pad Thai Stuffed Squid to Pina Colada Stuffed Panna Cotta. The book looks great and the recipes sound incredible! I am so happy for him. 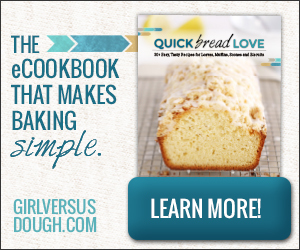 I actually tested some of the recipes for the book and feel like I saw it coming together. Holding a copy of it in my hands felt a little unreal. Once I got over my initial excitement, I started looking through the recipes and immediately noticed that Dan included a heat scale (great for wimps like me) and a pig-out scale (yes, a pig-out scale!) with every recipe. The heat scale, pretty self-explanatory, rates the heat level of each recipe. The pig-out scale tells you the level of "overall gluttony," according to Dan. Being the type of person I am (you know, the type who loves food), I immediately paged through the book, looking for the recipes with the highest pig-out scale ratings. Epic Timpano and Turducken, I'm looking at you. While those are on my maybe someday list, I started out with a recipe that gets a 6.6 on the pig-out scale: Meatball Wellington. Dan's Meatball Wellington is a simpler (and incredibly tasty) take on beef Wellington. It reminds me of a meatball sub but has more intense tomato flavor from a thick, pasty tomato sauce, and it features a wrapper of flaky, buttery puff pastry instead of a roll. While it is easier to prepare than beef Wellington, it still requires a little effort. First, you make the tomato sauce (a mixture of sautéed onions and garlic, tomato paste, water, and Parmesan cheese). While that cools, you prepare the meatball mixture -- which is similar to most meatball recipes I've made except that Dan has you process the milk, bread, egg, garlic, and parsley in the food processor to make a paste that you then add to the meat (a combination of ground beef and turkey). A handful of Parmesan and a touch of salt finishes it off. This is where things get fun. You have to spread the meat mixture into two long rectangles, line up some sticks of mozzarella cheese on top, and roll the meat up around the cheese to form two meat logs. The logs then get some time under the broiler until they're nice and brown. Once the logs are cool, it's time to break out your puff pastry. You spread some of the tomato sauce on each piece of puff pastry, place a meat log on top, and wrap the puff pastry up around the log. Finally, you seal the seams, brush with egg, bake, let cool slightly, slice, and serve! The Meatball Wellington makes for great party food, so if you're still looking for something to make for the Super Bowl or you're having friends over for another occasion, you'll want to give this appetizer a try. I am always looking for appetizer ideas, and surprisingly my vegetarian aunt came up with this one. Her idea was wrapping each meatball individually, but I thought that was too much work. I made the meatballs into a mini meatloaf and wrapped it similar to an actual beef Wellington, which is normally made with a whole beef tenderloin. Instead of the mushroom paste usually used, I made a tomato sauce that was super thick and pasty. Make the Tomato Sauce: In a skillet over medium heat, cook the onion in olive oil until it just starts to brown, about 10 minutes. Add the garlic, followed by the tomato paste, and cook for about 3 minutes. Add the water, oregano and cheese. Stir and cook for about 15 minutes and remove from the heat. Season with salt. Allow to cool. Make the Meatball Filling: Put the garlic into a food processor and pulse to finely chop. Add the milk, bread, egg and parsley to the food processor and process until well combined. It should look like a thick gray paste with flecks of green. In a large bowl, mix the beef and turkey, then add the garlic mixture paste, Parmesan cheese and salt. Mix gently until well combined. Form the Logs: Split the meat into 2 equal balls. Cut the mozzarella cheese into strips about the size of string cheese. Roll the meat into two long, thin rectangle shapes and place strips of mozzarella cheese on top, almost as if you were about to make a meat sushi roll. Roll the logs of meat around the cheese and seal well. They should only be about 1½ inches (3.8 cm) in diameter. Place on a baking sheet (no need to oil or grease the sheet) and broil on high for about 7 minutes to brown. Roll the meatball logs over and broil another 7 minutes to brown the other side. Stuff It! : Thaw your puff pastry according to the package instructions. Lay out a pastry sheet and spread it with some of the tomato sauce. Place the cooled meatball log on top and roll up the pastry around it. Seal it off at the ends. Beat an egg with a splash of water and brush the egg wash mixture onto the pastry. Cook It: Preheat the oven to 400˚F (200˚C, or gas mark 6) and bake the logs for 20 to 25 minutes, until browned. If you see any of the filling leaking, take it out of the oven. Allow your meatball Wellington to cool for about 10 minutes before cutting into 1½-inch (3.8-cm) slices; serve with toothpicks! 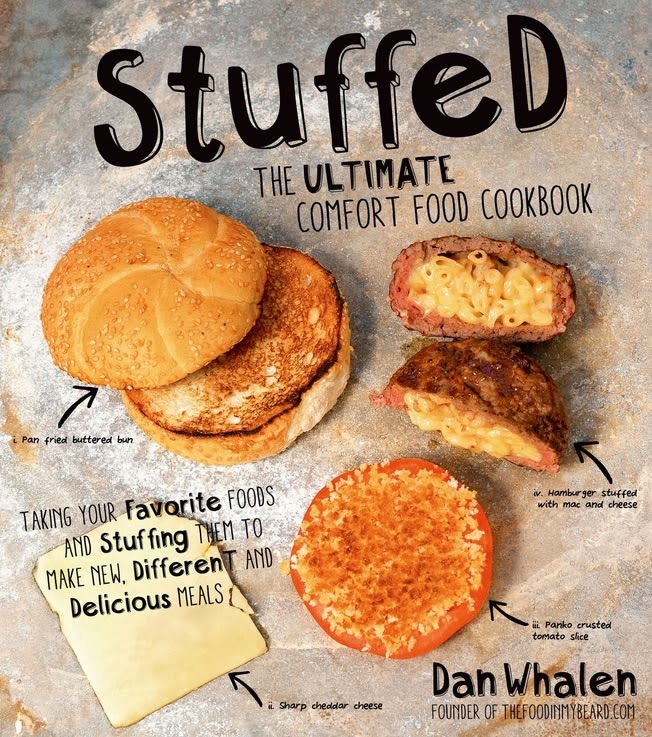 For more Stuffed recipes, enter to win a copy of Dan's cookbook! And be sure to check out other great recipes from the book on the Stuffed Blog Tour! Remember to enter to win a copy of Stuffed, using the Rafflecopter above! I received a complimentary copy of Stuffed, but as always, all opinions are my own. The giveaway is open to residents of the United States and Canada. This post contains Amazon affiliate links to Stuffed. If you follow the links to purchase the cookbook or make other purchases, I'll earn a few cents.